The Bainbridge park district took advantage of the sunshine Wednesday to celebrate the opening of Hilltop trail and park. The trail, which links east and west portions of Grand Forest, has been enjoyed by hikers since winter. The park district also renovated a house on the property for classroom and event space. “This has been a dream for us for a long time,” park board Chair Tom Swolgaard said of the Grand Forest trail connection. 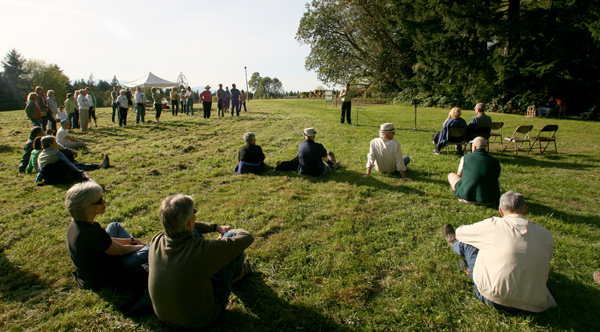 Bainbridge Island Land Trust reminded attendees that fundraising for the project continues. The Land Trust agreed to purchase 36 acres in the Hilltop area for $3.6 million. Eight acres were obtained by the park district for the trail and classroom space. The Land Trust has $360,000 left to raise.